Some big news to announce to our guests, we now have NBN internet. We understand that when traveling, you have a lot to catch up on! From Facebook to Youtube, University Lectures or just a video call home. You can now do all these things with the added benefit and speed of the NBN! This week we’d like to touch on long term accommodation for those attending Charles Sturt University. We understand that coming to Residential School is tough! At Globe Apartments, we try to make you feel at home, and provide you an environment that encourages and promotes productivity and relaxation. An apartment with us for the week will give you access to NBN internet, your own private: kitchen, laundry, bathroom and living room, as well as a desk to study on. By having everything you need and could want in the one location, you will be more relaxed, be able to cook for yourself, wash your clothes all whilst have a secluded study zone to get you through your Residential School. Our apartments book out fast, so please give us a call on 0269 212 388 or pop over to our bookings page. Welcome to the Globe Apartments Wagga. The newest and most unique boutique accommodation in the heart of Wagga Wagga city. 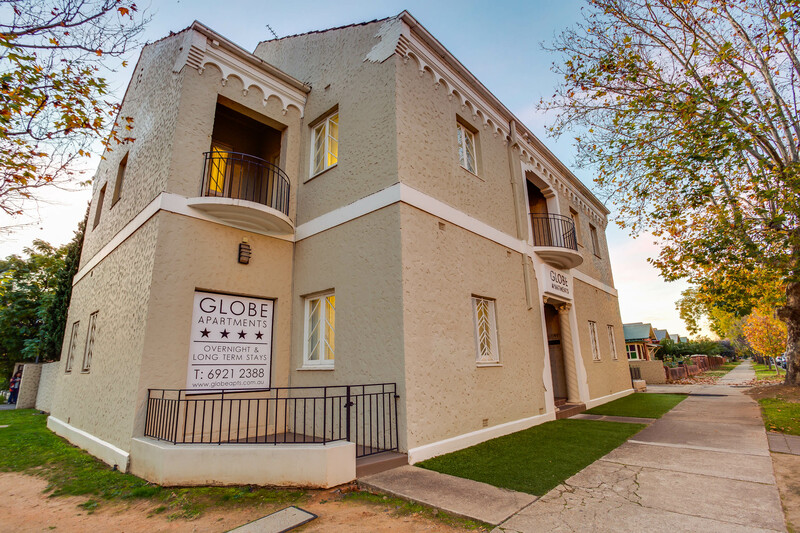 Chic and stylish, the Globe Apartments Wagga – originally the Globe Hotel in the 1880s – comprises totally refurbished fully self-contained serviced apartments.